I have come out bearish on the semiconductor equipment industry before and the latest numbers from SEMI do nothing to change my attitude. The chart below shows the dismal trend. Bookings are about 8% less in April than in March. More ominously, the April 2008 number is 32% lower than April 2007. Associated with this, the book to bill ratio has now dropped to 0.81, indicating orders are coming in at a slower rate than shipments are going out. In general, growth in the industry can be considered to be flat to down. We have in the past pointed out that over-capacity in the memory industry is keeping a lid on semiconductor equipment sales growth. On the flip side, red-hot growth in the solar industry is providing some support to those semiconductor equipment manufacturers that offer a product in this segment. Applied Materials (AMAT) comes to mind. Without the solar mini-boom I suspect this chart would look even worse. In contrast to the equipment makers, we have the semiconductor manufacturers themselves. Below we see a chart of worldwide chip sales. The chart shows the usual end-of-year boom-to-bust seasonality that chip sales tend to display. It also shows the beginning of a rebound in sales in March. 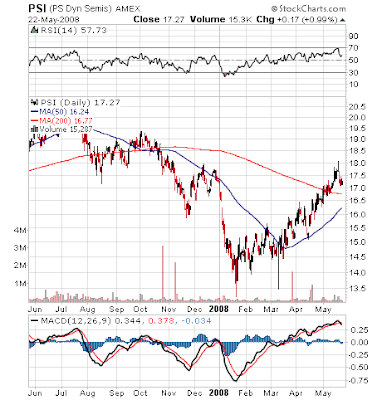 Now look at the chart of the PowerShares Dynamic Semiconductor Index ETF (PSI). It almost the inverse of semiconductor sales! Note that this ETF contains a mix of chip makers and semiconductor equipment makers though the chip makers are in the majority. The industry in general is kind of a mess. A small minority of the semiconductor equipment companies are doing well; the rest not so much. This remains a sector to avoid. The chip makers are also turning in mixed results but at least worldwide sales are starting to show an upswing. If the consumer can afford to continue his/her love affair with electronics the upswing will continue. The semiconductor ETFs have been rallying which indicates to me that the large and mid-cap companies are finding favor with investors. There have been many disappointments among individual stocks, however, making the sector a tricky place to put money to work. For now, the semiconductor ETFs seem the best way to play the sector, especially as the recent pullback begins to make them more attractive. Having rallied 33% from the January low, PSI, for example, is still up 27% even after the two big days of selling we saw earlier this week. I suspect it will get cheaper still and provide a more conservative entry point within the next week or two.